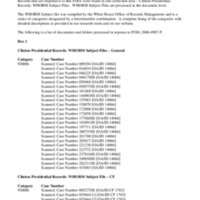 This collection consists of materials assigned the subject code ND006 by the White House Office of Records Management (WHORM). This subject code is for matters related to intelligence. These files contain correspondence, drafts of legislation, and reports on issues regarding that topic."